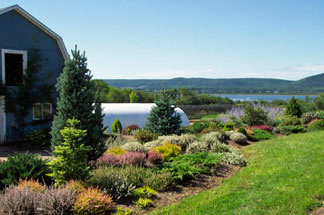 Bunchberry Nurseries is a specialty garden centre located in Upper Clements, Nova Scotia. We specialize in alpines, heaths/heathers, dwarf conifers, rhododendrons and other shrubs, grasses and a vast assortment of perennials. We welcome everyone to come and visit our spectacular display gardens and to browse our impressive selection of plants and accessories for sale. In 1995, Bunchberry Nurseries started out on a small piece of property in Berwick but moved to Upper Clements, Nova Scotia in 1997 for the extra space and a significantly better climate. The nursery began as a wholesale provider for other nurseries, located mostly in Atlantic Canada, but since 2006, now operates a successful retail business. Jill Covill is the owner and president of Bunchberry Nurseries. Jill attended the Nova Scotia Agricultural College in Truro and completed her Bachelor of Science in Agriculture at the University of Guelph. She graduated with a major in Horticultural Science. She also holds an International Diploma in Ornamental Horticulture. Before launching her own business, Jill perfected her trade, working in nurseries in Switzerland, Ontario and here in Nova Scotia. The retail nursery is open during the growing season and by appointment or chance for the remainder of the year. In addition to our extensive collection of plants, we also sell garden tools, accessories and garden furniture. We periodically conduct seminars on various gardening techniques, hold workshops and organize events with special guest speakers throughout the season. Please check here for more information. Bunchberry Nurseries also does contract propagation and growing. Recent orders have been for biofiltration plants including rushes and sedges (Cyperaceae family) for rain gardens, constructed wetlands and bioswales.